You can get this DVD for a minimum donation of $20. GET IT HERE! Click here to visit our new shop! The 9/11 terror attacks continue to send shock waves through the American political system. Continuing fears about American vulnerability alternate with images of American military prowess and patriotic bravado in a transformed media landscape charged with emotion and starved for information. The result is that we have had little detailed debate about the radical turn US policy has taken since 9/11. 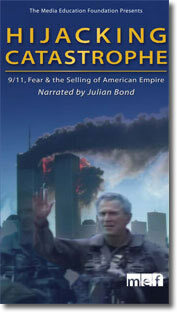 Hijacking Catastrophe: 9/11, Fear & the Selling of American Empire examines how a radical fringe of the Republican Party has used the trauma of the 9/11 terror attacks to advance a pre-existing agenda to radically transform American foreign policy while rolling back civil liberties and social programs at home. The documentary places the Bush Administration's false justifications for war in Iraq within the larger context of a two-decade struggle by neoconservatives to dramatically increase military spending in the wake of the Cold War, and to expand American power globally by means of military force. At the same time, the documentary argues that the Bush Administration has sold this radical and controversial plan for aggressive American military intervention by deliberately manipulating intelligence, political imagery, and the fears of the American people after 9/11. Joining Kwiatkowski in a wide-ranging, accessible, and ultimately empowering analysis of American foreign policy, media manipulation, and their global and domestic implications, are former Chief UN Weapons Inspector Scott Ritter, former Pentagon analyst Daniel Ellsberg, Nobel Peace Prize Laureate Jody Williams, author Norman Mailer, MIT professor Noam Chomsky, Code Pink founder Medea Benjamin, defense policy analyst William Hartung, author Chalmers Johnson, and Army Special Forces Master Sergeant Stan Goff (Ret. ).